This week seems to have zoomed past, juggling work, family, friends and an assortment of children’s activities. I’ve also been ploughing through bank statements and budgets trying to work out what we need to save where and still feel like I’m knee deep in numbers. 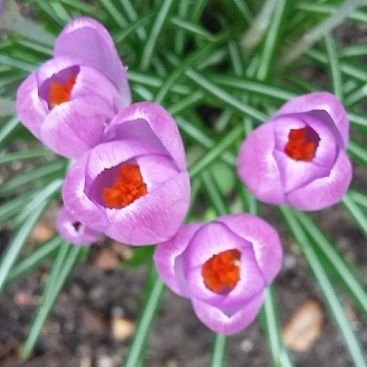 Anyway, I was glad to carve out the time to write a post to mark International Women’s Day (10 lessons I’d like to teach my daughter about money) and now here’s my round up of our five frugal things this week. A Pokemon caught during our walk. I am far too old to know which one. On Sunday it was pretty sunny in Suffolk, so I wanted to drag the kids outside for some fresh air. Fortunately they recently became obsessed with Pokemon all over again, and were keen on a walk too, provided they could play Pokemon Go on my phone. If you’re unfamiliar with Pokemon Go from the first time round, it’s a smartphone game that uses GPS to show you a map of your local area. 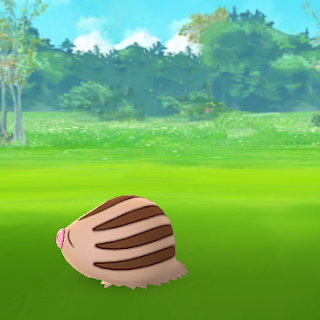 You then walk around collecting Pokeballs, hunting Pokemon, and battling other people’s Pokemon, while trying not to get run over or bump into people anyone you’re staring at a phone. I let the kids decipher the map and choose the route, and we ended up heading along the railway walk for one particular pokestop, then taking in highlights of Hadleigh while testing the limits of any WiFi connections. So in the end we all got out for a walk in the spring sunshine (happy mother) while playing Pokemon Go (happy kids), and it cost precisely nothing at all. Free wine? Finally my husband saw the point of supermarket cashback apps. Remember last week I mentioned Shopmium, the supermarket cashback app? Well thanks to some kind readers signing up with my code, I was able to use referral credits to get some free wine and ice cream. My husband swung by Sainsbury’s to buy the stuff on Monday evening, I sent a photo of the receipt on Tuesday, and the money hit our bank account on Friday. The ice cream came in very handy for pudding and when I was feeling sorry for myself after having my teeth cleaned at the dentist’s (Is there anything more painful? Seriously?). 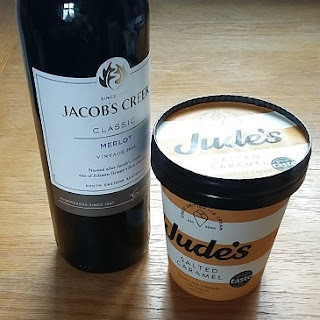 So fill your boots with Jacob’s Creek Merlot for £3.50 and Jude’s ice cream in some fabulous flavours for £2, and if you download the app with code KFKKAMKL you can grab a free bar of Lindt chocolate too. Check when the offers end, especially if you do internet deliveries, to make sure you can buy the product and submit the receipt before any deadline. Sigh. Somehow brown food just doesn’t photograph well. It tasted great, really! Fortunately, the dentist did not drive me to knock back an entire bottle of free wine. 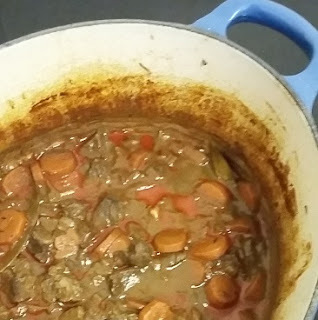 Instead, I used a decent slug in beef stew, made with yellow-stickered stewing steak from the reduced section in our Co-op. Once you’ve bought the beef, the other ingredients are inexpensive: onion, celery and carrots, plus store cupboard staples of tomato puree, flour, bay leaves, thyme and a beef stock cube. My daughter sang in the school choir at a concert in Snape Maltings yesterday evening (proud parent alert). To get there in time we needed to leave virtually as soon as my husband got back from work. Instead of buying food on the way or going hungry, I made the stew the night before. That way, he could take some as a hot meal with rice at lunch time, and then just grab a quick sandwich before we ran out of the door in the evening. I’ve written in the past about my top tips for cutting costs with yellow-stickered food, but now I’ve even taken part in a video about saving with yellow-stickers, made by Tom over at Latest Deals. Check it out if you want to see me and a whole host of other UK Money Bloggers in action. NB: I did not chose the wallpaper. Just saying. Pension paperwork. Contain your excitement. The thing I like about pensions is the free money. For every £1 you pay into the pension, the goverment bungs an extra 25p on top. I don’t know many savings accounts where your money increases from £1 to £1.25 as soon as you pay it in. As an added bonus, if you pay into a work pension, some employers will chuck in extra money too. Opting out of a work pension if they’re willing to contribute is like turning down a pay rise. In exchange, you can’t get the money out again until you’re at least 55 so it’s not a good plan if you might need the money next Thursday. Sure, there are headache-inducing rules and the real winners from pension contributions are people who pay higher rates of income tax, but if we’re ever going to stop working, we need to set some money aside beforehand. 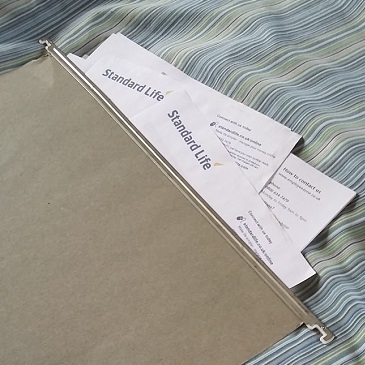 Pensions get a lot of bad press, but I see them as one part of paying our bills in future. Anyway we’ve got some cash sitting around earning next to nothing after a couple of decent-paying regular saver accounts finished at the end of a year (5% from First Direct and Nationwide if you also have their current accounts). We’re not intending to spend the money in a hurry, so rather than starting new regular saver accounts, we’d like to add cash to my husband’s pension. You can only pay in a certain amount each year, so I double-checked the numbers to make sure we’d be OK.
New allowances start from April 6, so if we want to take advantage of this year’s limits, we need to get a shifty on. 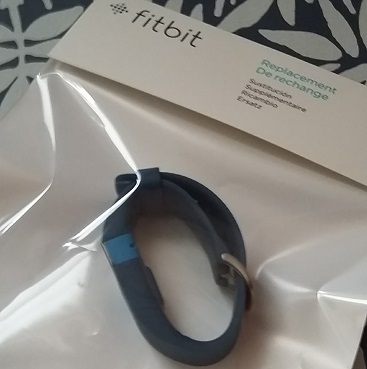 Many cheers, the replacement for my broken Fitbit showed up this week. As mentioned before, I checked the guarantee when my birthday present Fitbit broke, and discovered I could send it back for a new one. It did involve forking out £8.70 on tracked postage to the Netherlands, and faffing around with the rules about sending devices with batteries through the post. Turns out bubble wrap and a padded envelope are insufficient for a device that might contain rechargeable lithium batteries, and might get squashed in the post, and if squashed might burst into flames. Imagine my joy when I got sent home from the Post Office, and told to return when it was packed inside a cardboard box or original packaging. However, in the end the postage cost a lot less than a new fitness tracker, so good news all round really. So now – over to you. Any frugal successes to share? Ideas for where else to cut costs or earn more? I’d love to hear. If you’re kind enough to use a referral code, then I’ll get a few pounds, and you’ll get chocolate, but you can also download the app without using any code at all. It's a tough one. Leftovers are a killer for me because I hate food waste. A lot of budget cooking is about filling people up with cheap carbs (pasta, rice, potatoes, bread) rather than more expensive protein. My recent Shopmium stash of biscuits, ice cream and wine is hardly a great example of a healthy diet! Makes a nice treat on occasion though. Shopmium is on fire at the moment! My favourite ever biscuits were free this week too! It's nice to get free treats because I wouldn't buy them for myself otherwise. Glad to hear about your favourite biscuits – great to get the occasional treat for less. I don't know if I've been living under a rock but shopmium has completely passed me by until now?? Need to really look into that! I'm off to a free family fun day with my sister tomorrow, which has a petting zoo and crafts for kids, so hopefully a fun but frugal one! The frugality might end by the evening when I treat myself to a nice bottle of wine though! Definitely worth giving Shopmium a whirl, especially as they don't have a minimum payout so even if you just try one thing you'll still get reimbursed. Hope you enjoyed the family fun day! That beef stew looked REALLY nice, it's been ages since I've had beef stew. Might look at putting it on the meal planning for the week after next. Thanks for the Pokemon top tip. My children roll their eyes at my ignorance on all matter Pokemon, so I may yet be able to surprise them by recognising one.